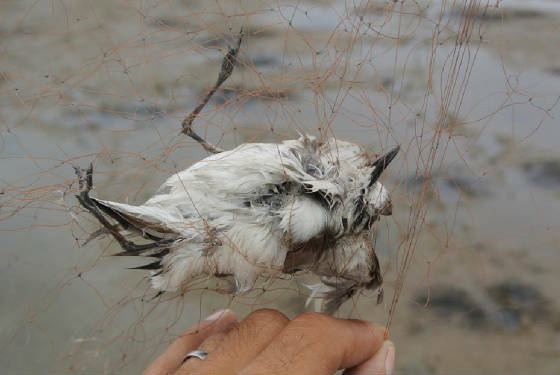 One of the innumerable slaughtered birds in the "death zones"
In the past few days, countless numbers of shore birds have been trapped and killed in mile after mile of nets that cover the shoreline of four different areas of China's Guangdong province. That's more than 33 kilometres or 20 miles of death traps. 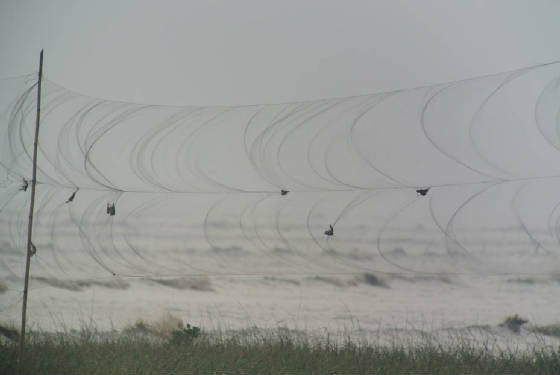 In the photo below, you can see the bodies of six wading birds in a 25 metre section of net. 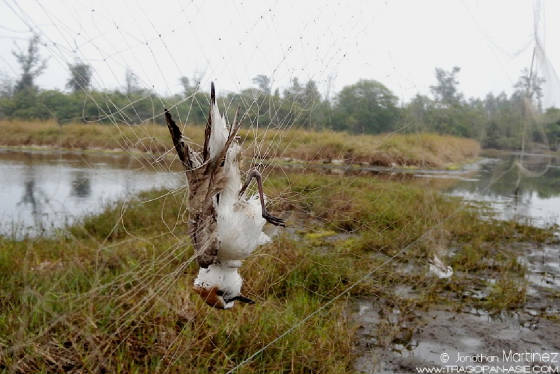 Most nets are emptied daily (and the carcasses sold to local restaurants), so, if the body count in this net were representative of the level of carnage in the area, then more than 8,000 birds would have been slaughtered yesterday. And close to a quarter of million birds will be killed during the month of November alone. But only a few of the numerous coastal areas of Guangdong province have been surveyed recently; so the number of nets found is likely to be only a small fraction of the number of nets that have been set. Whatever the number of nets, the actual death toll is of course incalculable. But even in the most optimistic of less-worse-case scenarios, the magnitude of the devastation is unimaginable. Among the millions of shore birds that run the risk of being netted as they fly across the coastal areas of Guangdong province, there is an unknown number of Spoon-billed Sandpipers – one of the world's most endangered birds. "It is absolutely certain that Spoon-billed Sandpipers pass through these [heavily-netted] areas on their way from known migration [stop-over] sites to known wintering locations." In an email yesterday, Mr Martinez says that Guangdong is the only flyway taken by Spoon-billed Sandpipers, and that Spooners passing through this area "Encounter a wall of mist nets along more than several hundred kilometres of coast. And birds wintering in an area with so many nets have simply just no chance to survive the winter!!!" It is clear that the very survival of this iconic species could well depend on the authorities taking immediate action in the "death zones" that Mr Martinez and his co-workers have pin-pointed. 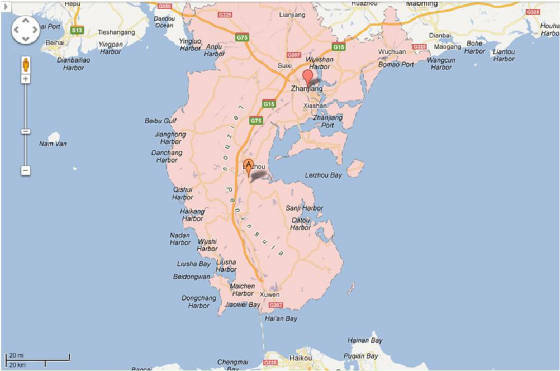 Among these, the priority is to tear down the nets that scar the sand flats and coastal areas of Dianbai county, which is under the jurisdiction of Maoming city. Mr Martinez says [this morning's telephone call], "All of the suitable habitat for Spoon-billed Sandpiper in the area here is surrounded by nets." As well as this danger, I have also seen long-lens photographs of a poacher in the Dianbai area carrying something than can only be described as a punt gun. Carrying a gun of any description for any reason is a serious crime in China. At least some of the local authorities in Guangdong actually do care, and have struck hard against the poachers in their areas. Mr Martinez talks glowingly about the efforts of the Xitou Forestry Bureau in Yangxi county who not only patrol diligently, but also respond immediately when they receive a tip off that there are poachers about. Their quick response has resulted in a number of arrests, which in turn have led to a dramatic reduction in poaching activity (as you would expect, news travels quickly within poaching circles). For the sake of the Spooner (as well as hundreds of thousands of less famous birds), it is critically important that the Maoming (and other) authorities are equally quick to respond to the cry for help. If you would like to add your voice to that cry, please post your comments in the box below the photos. At 09.10 on the 12th February, I had the tremendous good fortune to glance in the right direction at the right time. I knew before I picked up my binoculars what it was, but I was unwilling to believe it even as I watched it flap majestically over the dense canopy of trees that carpets the mountainside close to the Husa township in western Yunnan. “…Unbelievable,” I repeated to myself as I watched the Wreathed Hornbill – one of Yunnan’s rarest and most endangered breeding birds – fly for more than a mile. I even had time to put my binoculars down and pick up my camera to get a shot for the record. This would later serve to reassure me that I had enjoyed much more than a very sweet day-dream. It was only my third “experience” of this spectacularly long-winged, prehistoric-looking bird. That’s not many experiences when you consider that I first came to China to watch birds in 1988 – a quarter of a century ago. For most of that time I could only dream of finding one. It took me until 28th March 2009 to realise that dream. Not satisfied with a single encounter, a year later I went back again to the same place – within a stone’s throw of the border with Burma – and saw the species again. This most recent sighting, though, is the most significant of the three because Husa is not a border area, and it also seems to be a “new” site for this species. Sadly, it is a site that is under threat. Just after I had pinched myself and checked to see if the image was really on my camera (it was!) I came back to earth with a bump. Distantly, but alas unmistakeably, I heard the frenzied scream of the spectre that haunts Yunnan’s forests. It is the sound that sends even the most optimistic of nature-loving souls into a fearfully deep depression. It is the sound of the chainsaw. It is a sound I heard every day during my recent visit to Yunnan – except for the time I spent in the Gaoligongshan (but even there, there was evidence of logging). It was painfully obvious to me that each place I visited had suffered a significant loss of "quality" trees since my last visit to the area, three years before. In places to the south of the ridge, the Husa area looked like a tornado had cut a giant's walkway through the ancient forest. But on closer inspection, I could see that the grand old trees had been logged and replaced by upstart saplings, which would soon grow into cash crops. From a bird’s perspective, not all trees are created equal. It's important to sound a cautionary note here about headline tree-numbers and reforestation projects generally… because planting the “wrong" trees can be more damaging than planting no trees at all. The damage inflicted on the province’s eco-system and the bird and animal life that depend on it is irreparable. This degradation is painfully obvious to anyone with an interest in the natural world who has been to Yunnan. The eco-sensitive Yunnan-visitor will not be surprised by the findings of a report on the state of the province's forest-cover, published by Greenpeace on the 30th January. The headline of the press release that heralded the launch of Yunnan Natural Forests in Crisis is as stark as it is depressing: "Yunnan: Only 9% of the Forest Is Primary Forest". The release focuses on the report's findings that "...the quality of natural forests is much lower than originally thought" and that "a massive area of natural forests has clearly been cut and then converted into plantations." [The press release is here; the report, which is in Chinese, can be downloaded by clicking here]. 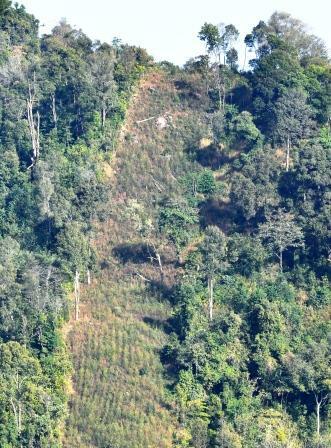 Even greater devastation has been inflicted by chainsaws over the border in Burma. 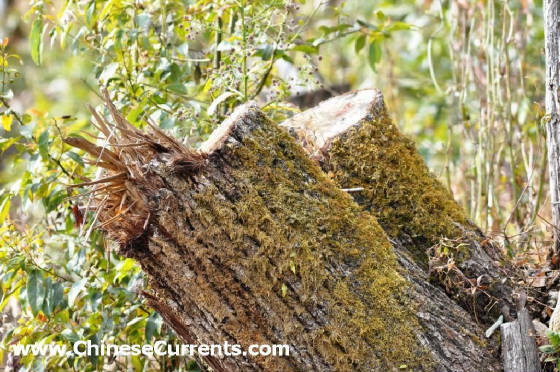 In its report Appetite for Destruction (that can be downloaded here) the Environmental Investigation Agency (EIA) provides evidence that points to a number of Yunnan-based companies sponsoring those chainsaws. Chris Moyes, an EIA forests campaigner, discusses the wider issues concerning the export of Burmese logs to China in an article published here on the Ecology website. "Most devastatingly, much of the area's [eastern Burma's Shan state's] teak has been cut down and smuggled over the border to China, often with the help of the [Burmese] army. In the hills near the Chinese border it looks as though someone has taken a giant electric shaver to the landscape, so thorough has been the deforestation." Given the extent of the destruction of forests over the the border in Burma, it is not beyond the realm of possibility that the lone Wreathed Hornbill I saw at Husa (possibly the first time the species has been seen in the area) had, following its eviction in Burma's Shan or Kachin state, headed eastwards to Yunnan to seek a new home. This thought, which entered my head soon after seeing the bird and hearing the chainsaw, added extra poignancy to the sighting. If this hypothesis is true – that rampant logging in Burma is causing displaced birds to seek sanctuary in Yunnan – then the comprehensive protection of the province's remaining primary forest is a matter of life or death to even more birds than previously thought. Tang dynasty poets waxed lyrical about them; Ming dynasty emperors coveted paintings of them; Qing dynasty artisans emblazoned their images on the finest porcelain. Throughout much of Chinese recorded history they have been synonymous with longevity and with the best of luck. Sadly though, the Red-crowned Crane's own luck appears to be running out. If the dramatic decline in wintering-numbers witnessed in recent years continues, the Red-crowned Crane's "Western Flyway" population could become extinct before the end of the decade. In other words, the species would disappear as a migrant and wintering bird across a vast swathe of China. If that happens, then the species' breeding strongholds would be reduced from four to just two: The non-migratory Japanese population (which, at more than 1,300 birds, has become the largest of the population groups); and the Russia and NE China population, of just over 1,000 birds, which migrates via the "Eastern Flyway" to winter on the Korean peninsula (mainly at Cheorwon in the DMZ, but also in three other locations). In the 1990s, this Eastern Flyway population was outnumbered by Western Flyway birds by a ratio of 3:1. The accepted wisdom is that the ratio is now 1:2; and nudging ever closer to 1:3, and a complete reversal of fortunes. Su Liying and Zou Hongfei in their 2012 paper [Here] described the most recent speed of decline in the Western Flyway populations as "frightening". Except for "15-75" birds that winter at the Yellow River Delta Nature Reserve, in Shandong province, and perhaps a few stragglers elsewhere, the entire Western Flyway population winters at one location: at Yancheng National Nature Reserve (NNR) in Jiangsu province. There were 1,128 Red-crowned Cranes at Yancheng in the winter of 1999-2000. Nine years on, in 2008-2009, the number wintering there had fallen to around 400 birds. I of course knew that wintering numbers had fallen dramatically in recent years before I boarded the Yancheng-bound public bus in Shanghai, last week. But I only had the vaguest idea of the root causes of the China-wintering-population's sad decline. I had thought that the drying-out of the breeding grounds in northern and north-eastern China was largely responsible. Four hours later, I arrived at the city of Yancheng. Less than one hour taxi-ride after that, I was watching birds at Yancheng NNR. I was also beginning to reshape my opinion of the issue. But it was not until my second day there, and only after I had seen a vast area, that I came to the conclusion that the people who have been responsible for the management policy of Yancheng NNR must take at least a slice of the blame for the dangerously rapid decline of the Western Flyway population. To put it bluntly, the extent of the deterioration of the habitat, since my visit there in December 2001, was shocking. Where 11 years ago there were reed beds, there were now shrimp and fish ponds. Miles and miles of them. On returning to Beijing, I would spend two days researching the local management-policy changes that had led to this. Buried deep in the vaults of a Chinese search engine, I found a report written by Xiao Hua [Here] with the headline, "Yancheng Red-Crowned Crane Emergency". 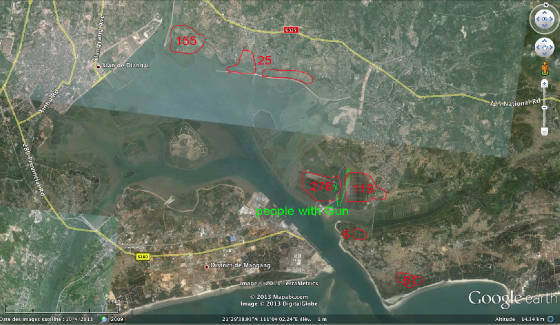 According to Mr Xiao, an investigative reporter, the Yancheng nature reserve authorities signed a 5 year contract with one named person to lease out 14,918 mu [9.95 square kilometers] of wetland for conversion to aquaculture [shrimp and fish farming]. The contract period was from 1st January 2008 to 31st December 2012. Mr Xiao reported that the reserve made 2 million yuan per year from this deal, and that the person who had bought the right to use the land, had then sub-leased it to local farmers, making a sizeable profit. One of many questions I haven't been able to find an answer to so far is, what has happened to this land following the expiry of the lease? Suffice to say that the reserve's management have a golden opportunity to restore this land to its former glory. Another key issue is the land use policy relating to agriculture in the area. To the north of the reserve, there are dozens of square miles of fields. It is there that I took the photograph of the family of four Red-crowned cranes that appears at the top of this report. 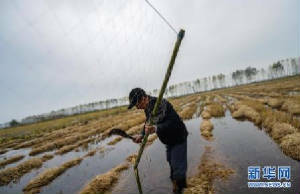 Indeed, Su and Zou, citing Ke et al  state that, from 1988 to 2006, between 53.8 and 66.91 per cent of Yancheng NNR's wetland was lost to “aquaculture, diking, and farming”. As is well documented, human encroachment of wetlands is extremely bad news for wildlife. In China, trapping and poisoning often go hand-in-hand with farming and aquaculture. 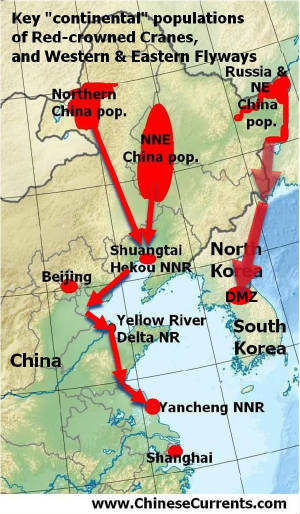 In their 2012 paper, Su and Zou list the poisoning incidents of Red-crowned Crane in China that have made it into the public domain. 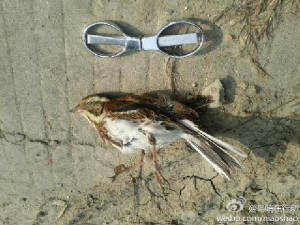 At Yancheng, in 13 years (from winters of 1995-95 to the winters of 2008-09), 61 birds were found poisoned. 33 of those 61 birds died. In the winter of 2008-09, seven birds died (all of those that were reported to have been poisoned). 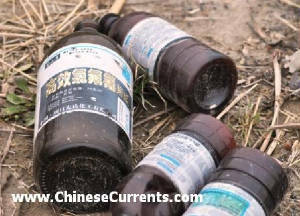 On my visit to Yancheng last week, I found more than a dozen empty bottles of poison (my photograph appears here). The bottles were on a path next to a dike, only tw o hundred yards away from a large flock of Common Cranes [about 1,200 were in the vicinity] and about 20 Hooded Cranes; and only 1 mile north of where I had photographed the Red-crowned Cranes the day before. 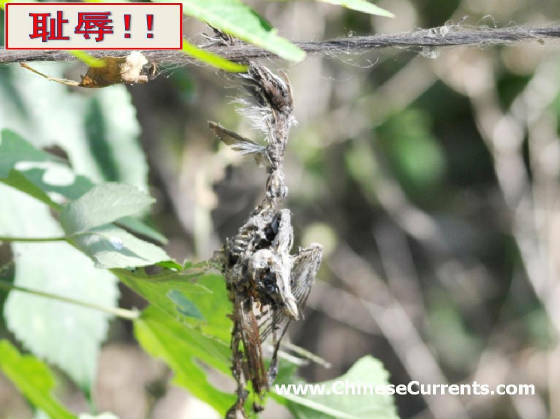 Enquiries on Sina Weibo [China's most popular Twitter-like microblogging site] revealed that this poison was an agricultural pesticide, and the consensus was that it had been used to treat crops and not to target cranes or other birds. This may well be the case. But, the important point to note is that, for more than 5 years now, the use of any agricultural pesticide has been banned in this area [In October 2007, the Xinhua news agency reported [Here] that, "The use of fertilizers, pesticides and other chemicals has also been banned in about 6,000 hectares of farmland surrounding the reserve." ]. Another question this raises is, why had the bottles not been taken away by patrolling wardens, to be used as evidence to prosecute the farmers who are responsible for the spraying? On my first day at Yancheng, in addition to the family of four Red-crowned Cranes, I saw another party of three, that were also feeding on farmland. On the second day, I saw another party of three near to the reserve centre, and two adults three miles to the east of the reserve centre (incongruously searching for food on a drained shrimp pond). In summary, in two days birding there, I saw a less-than-grand total of 12 Red-crowned Cranes. That's not to say that there are not four, or even five hundred more in the core area of the reserve, the part that the public quite rightly isn't allowed to access. In 2001, the cranes could be easily seen from the public vantage points. On Christmas Eve 2001, I saw about 100 Red-crowned Cranes. On Christmas Day 2001, my present was the incredible sight of an estimated 230 Red-crowned Cranes. How many birds were actually there this winter, I enquired. "Hundreds," I was told. "How many hundreds?" I asked. "Hard to say," was the reply. 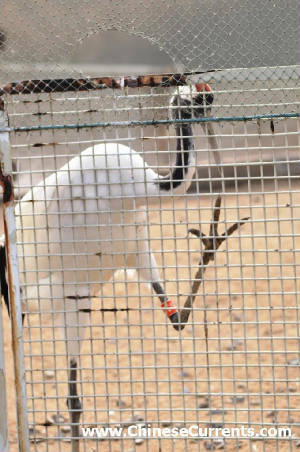 Sadly, I saw more Red-crowned Cranes in what the Jiangsu tourist web site [Here] describes as "...a small zoo where the wounded birds and animals are hosted for treatments..." than I saw in the wild. There were 20 Red-crowned Cranes in the "small zoo". Taking the website at its word, I looked for signs of injury. The caged birds (four to a cage mostly) looked to be in fine fettle. At times, some birds would fly around the cage, all the way up to the netting on the ceiling. But they did seem to be very wary of humans (when three tourists approached them to get some snaps). Then I saw the sign: "Red-crowned Crane taming [this word can also be translated as "domesticating" ] centre." "...Red-crowned Crane captive breeding... In the beginning 3 eggs from the North-East of China... Failed for many years... First breeding success here in the year 2000 ... 80 birds reared successfully here... Enjoy crane dancing... flying displays... and performances in the arena..."
Clearly the sign raises many more questions than it provides answers. As I was composing myself, I noticed the terraced seating area overlooking the display area. I looked at the Red-crowned Cranes in the cages. And I stared at the construction site that will, when complete, create a semi-circle of cages opposite the terracing that has a seating capacity of a few of hundred people. 7 cages occupied. 18 more being built. Room enough, when finished, for 100 Red-crowned Cranes. Sadly, the "small zoo", is about to become a big zoo. In another area there were cages with 4 White-naped Cranes; 4 Common Cranes; 2 Demoiselle Cranes; 4 Siberian Cranes; 2 Hooded Cranes; and 2 Oriental White Storks, as well as another 8 Oriental White Storks and a docile Red-crowned Crane on what the website describes as a "waterfowl lake" - together with a Black Swan, and various other domesticated waterfowl. Wild wintering cranes are not a popular tourist attraction. They are extremely wary of humans; and it is cold in Yancheng in winter... sometimes very cold. But the promise of a ringside seat to watch "crane dancing" in the warm Jiangsu spring sunshine is bound to pull in the crowds. And Yancheng NNR has access to potentially massive crowds within one hour's drive. Yancheng is not only famous for its nature reserve, it is also a prefecture level city with a population of 8.2 million people. The urban centre of which is less than an hour's drive away from the reserve centre. It's also a city that doubled its GDP during 2006-2010 [The period of China's 11th 5-year plan]. During that period the average per-capita disposable income of Yancheng's urban residents increased by a whopping 13.5 per cent per year [Source: Here]. Large increases in disposable income above a certain level feed through to rapid growth in car ownership, which in turn translates to greater expenditure on local tourism. It is not suggested that these birds came from Yancheng. It is important, however, to find out where all the captive Red-crowned Cranes are; As well as their age, condition and of course to also pinpoint where they came from, and how they got there. 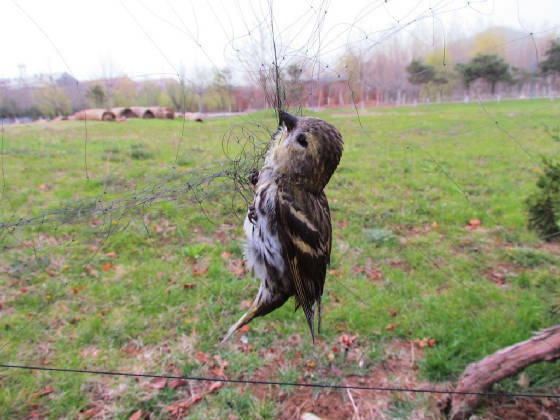 It is also important that one independent organisation (that doesn't have a financial interest) is able to coordinate this, to ensure that there is a net return of the birds to, as opposed to a net removal from the wild. I suggest that Rang Hou Niao Fei [Let migrant birds fly], an NGO that has done wonderful work protecting wild birds in China, steps in. I do not know how many Western Flyway birds, thus far, have been returned to the wild from captive breeding projects, but I suspect it is very few. But I do know that the captive breeding and rearing of Red-crowned Cranes at Yancheng has nothing to do with the reserve's main conservation goals and responsibilities. Captive breeding is not the solution to this population's dire problems. To safeguard existing habitat and restore and secure lost habitat on the breeding, staging, and wintering grounds. 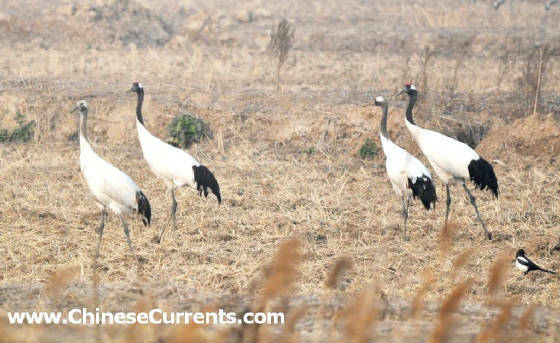 Only then will this precious population of Red-crowned Cranes be pulled back from the brink. It is well known that Guangdong province is a hot-bed for crimes against bird-kind. Despite recent crackdowns by the Guangdong Forestry Bureau, it seems that the trapping and trading of countless thousands of birds continues with impunity. But there is now light at the end of this extremely long and dark tunnel. Thanks to the work of foreign birders in important coastal areas of the province, the dangers that this contempt for the rule of law poses to the Spoon-billed Sandpiper (aka "Spooner"), one of the world's most endangered birds, has been spotlighted. The Shenzhen Daily reported on Friday (article here) that Jonathan Martinez found four Spooners on the Leizhou Peninsular in December. The paper also reported that he and Richard Lewthwaite saw 460 mist nets, each about 25 meters long, during a 10-day trip to the Peninsular, also last month. Obviously, there is worryingly high probability that at least one of those four Spooners would be caught in what amounts to 11.5 km of nets. Mr Martinez told the paper that, in the early 1930s, a French ornithologist named Pierre Jabouille saw numerous Spoon-billed Sandpipers during the one and half years he spent studying birds in Zhanjiang, a city in the northeast of the Peninsula. The future status of the species on the Leizhou Pensinsular will be, I feel, the acid test for the very survival prospects of this wonderful bird. It will also be the barometer of the success or otherwise of the bird protection movement in Guangdong. There is no doubt that having the Spoon-billed Sandpiper as the "poster bird" for the campaign will focus the Guangdong authorities' minds on the issue of bird protection generally (not least because the local threat to the Spooners has already received global attention - here). 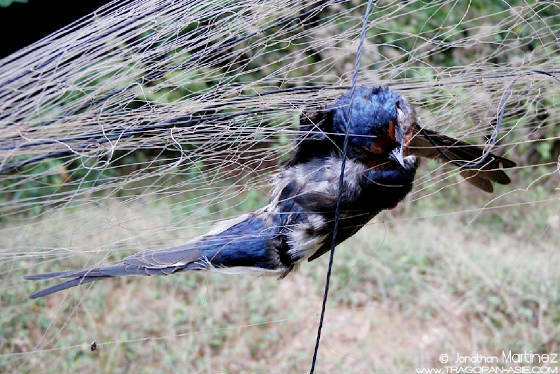 Nets don't discriminate between rare and not so rare birds. Therefore, for every Spooner that is saved by the effort to tear down the nets and to stop them reappearing, there will also be countless numbers of other birds saved. Clearly, the Spoon-billed Sandpiper is an important bird in many ways. "Thanks again for drawing our attention to this important conservation issue. Of all the countries that the spoon-billed sandpiper visits, China is probably the most important. Birds are present in China for the majority of the year - longer than they are in their breeding colonies. This unique species is the subject of much scrutiny around the globe. The world is watching and waiting to see if it can be saved from extinction. At the forefront of this fight are the people in China fighting to protect these birds on the migrating and wintering sites. Good luck in protecting this species. It's future is balanced on a knife-edge and your actions could mean the difference between extinction and survival. Thank you for being there and standing up for this tiny bird in difficult circumstances." The bravery of the people trying to stop this is humbling especialy when compared to the greed and incompetance of the authorities and poachers. "This is a horrible situation, a national disgrace. I urge the government of China to put a permanent end to these practices." "Very sad to hear about this, responsible governments should adress this at once!" "A number of countries and many conservation organisations have come together to try and save the Spoon-billed Sandpiper from extinction. 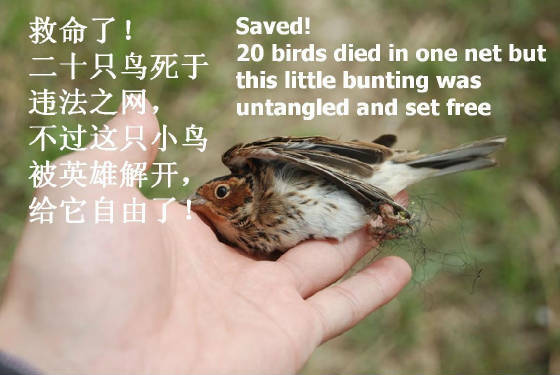 The help of China and its people is vitally necessary for the success of this project and many people around the world are currently looking for the Chinese authorities to take a lead and stop the destruction of habitat and the netting of the Sandpipers." One of the most beautiful birds there is, hope it will remain with us for a long time. "Please protect our rarer birds." "Please keep taking photographs of these obscene acts of barbarism. A nation trying to portray itself as modern and cultured should feel enraged and embarrassed by such occurrences." 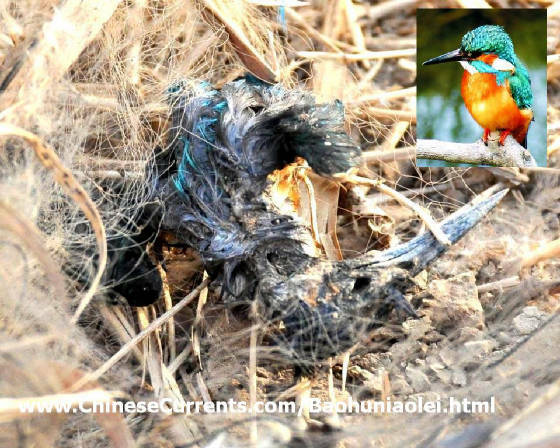 "Guangdong authorities need pay more attention to the mist nets to protect these endangered bird species!" "It took millions of years for all of this biodiversity to evolve, yet mankind seems set on a course to destroy it." "Crimes such as this give China a very bad international reputation. The Chinese authorities need to crackdown on wildlife crime, and understand their country's pivotal role in the future of Asia's wildlife." "Spoon-billed sandpipers are a critically endangered species. Conservation efforts worldwide are trying to protect them and the Chinese authorities must help out by preventing illegal trapping of these and other species." "These birds belong to everyone and no has the right to trap them anywhere in the world. Let the the good people of China help to save these birds so we can all enjoy them." Despite all the fine rhetoric and numerous crackdowns, the demons of Beidagang (where 22 Oriental White Storks were poisoned to death by poachers several weeks ago) are a long way from being exorcised. 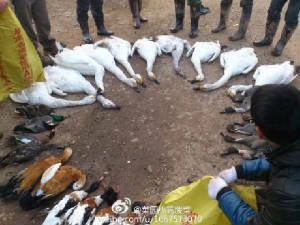 News broke this yesterday afternoon that 15 Bewick's Swans, and many other water birds, have been poisoned to death by poachers at Dongting Hu, one of China's most important national nature reserves and wintering area for tens of thousands of water birds. The parallels with Beidagang are chilling: It is reported that the same poison was used in the same way (by laying poisoned bait in small areas, controlled by the poachers). Unlike Beidagang (where only two suspects were reprimanded, after several days investigation), the local authorities have this time, it seems, struck at lighting speed. It is reported that no fewer than 9 suspects have already been apprehended. One of the positive parallels with Beidagang is that a team of guardian angels quickly arrived on the ground there. Li Feng, the photo-journalist who exposed the hunting atrocities in Hunan, is among them. Also, the Blue Sky Rescue Team, the volunteer group that did such a wonderful job at Beidagang, are on their way there. As was the case at Beidagang, time is of the essence. It is critically important that all of the areas that have poisoned bait are quickly located and rendered safe. The Shanghai volunteers were out in full force today for an all out assault on the nets of the illegal bird trappers in Songjiang forest area, in the upper reaches of the Huangpu river in Shanghai. 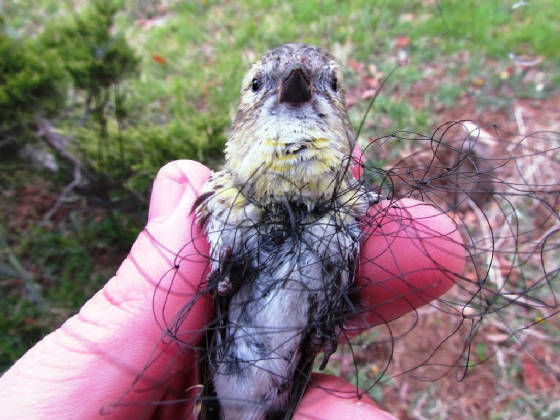 16 volunteers destroyed 153 illegal bird nets, with a total length of more than 1.9 kilometres. This is an astonishingly successful as well as an extremely tiring day's work. The leader of the action, whose Chinese name on his microblog can be translated as bird sentry in action, was too tired to add much more detail than "I'm exhuasted". His micoblog can be viewed here. Proof again - if indeed more proof were needed - that actions speak louder than words. Xingfu Market in Conghua, Guangdong province, is one of the biggest wild bird (and mammal & reptile) markets in China. Click on the above screengrab to view the report that was broadcast on CCTV13, one of the most important national TV channels, on 4th December. Brian from Guangdong writes: "The animals and birds which are sold there live or dead mostly end up on the table in restaurants or hotels... The demand is increasing due to the increase in wealth of the middle class and although the authorities are alerted they rarely do anything about it as the stall owners claim with the tacit approval of the police that the animals are farm reared. It appears that although a number of protected species are daily sold everyone turns a blind eye to the trade. There are two billboards near the entrance of the market showing 30 species of protected mammal with the fines listed for anyone found selling them, up to (100,000Rmb), which has absolutely no effect as one trader says most of the species listed can be found in the market daily...One stall owner on CCTV claimed that 1500-2500kg of animals, mostly birds were sold daily." On 10th December, Xingfu Market received a dishonourable mention in the hard-hitting report published by the Legal Daily (which can be viewed here), which had the following headline "广东建多项机制，保护监管不到位、执法不力将追究领导责任" [Guangdong province has set-up many mechanisms, but [wild animal] protection continues to be inadequate...This disregard for law enforcement is the responsibility of those leaders who are in charge of the investigations]. Xingfu market in Conghua, Guangdong province is clearly a barometer for the success or otherwise of the bird protection movement in China. It has been a busy 10 days for the departments responsible for enforcing the law on the illegal trapping and trading of wild birds. Up and down the country, perhaps thousands of police and officials from the forestry bureau and other law-enforcement departments have been involved in numerous raids on markets selling wild birds, the restaurants that have them on their menus, and the various other people in the long and tangled supply chain that sustains what is a multi-million dollar industry. This unprecedented spate of bird-protection activity is the central government's response to the poisoning to death of 22 Oriental White Storks at Beidagang, Tianjin, on the 11th November (see earlier reports). 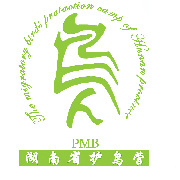 The catalysts for the protection-frenzy are the two "emergency notices" issued by the National Forestry Bureau [see 30th November article below]. These notices grabbed the local authorities' attention because they were publicly launched by Zhang Jianlong, the central government department's vice-minister and, as was reported last week, were backed up by the dispatch of 6 people from the ministry to various parts of the country, to supervise the local law enforcement effort and also to oversee "a batch of prosecutions". These proclamations also grabbed the attention of the national and local media news agencies, who quickly voiced their support for the campaign to make China a safer place for wild birds. 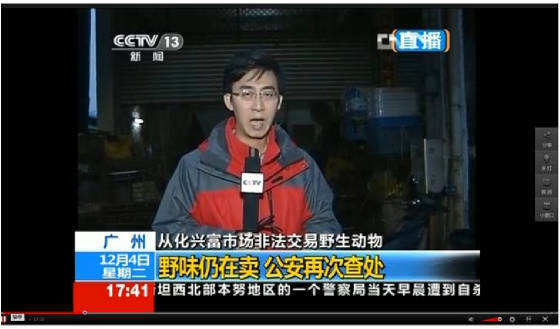 The most high profile report was perhaps an almost 6-minute long news item that exposes the horrors of the bird trade in Beijing that was broadcast on China Central Television on 30th November [It can be seen here]. The language used in the many reports concerning the law enforcement activities has some common themes: The action is invariably referred to as a 严厉打击 yanli daji [intense crackdown] and a 专项行动 zhuanxiang xingdong [special campaign], which is 开展 kaizhan [launched]. 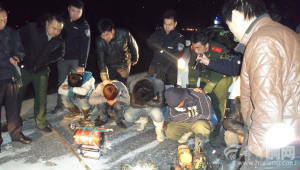 The photo that heads this report shows some of the 15 people who were arrested in Suizhong county, Liaoning province, after a "special campaign" was "launched" by the forestry public security bureau to "intensely crackdown" on the illegal hunting and trading of birds in the area [the photo links to the report that was published today]. Although these crackdowns on the illegal hunting, trapping and trading of wild birds are of course good news, there is a concern that many of the local authorities who have launched them are doing so solely to court positive publicity that will impress their bosses in the central ministry in Beijing. This cynicism is understandable given the impotence of the same local authorities in the past. Sadly, it has been the norm for them to 视而不见 shier bujian ["turn a blind eye"] to illegal bird-catching and trading activities. One of the "special campaigns" that has raised more eyebrows than most is the one that was trumpeted by the Guangdong forestry public-security bureau. On 29th November, shortly after the vice-minister's announcement of the crackdown, it was reported [here] that in October and November it had seized 51,622 wild animals and 9,497 bird nets, following investigations spanning 584 markets and 1,320 restaurants. According to the report, 102 people have been sentenced as a result of the crackdown. Guangdong province is one of the hotbeds of illegal bird trapping and trading, and it is a place where local officialdom and the word of the local authorities is held in low esteem. In a hard-hitting article yesterday, the China Daily reported that "Only 25 per cent [of local residents] are satisfied or relatively satisfied with the conduct of those working in local government and public institutions." The article goes on to say that, among those who have sought services at local government departments, "46 per cent agree that the services are provided only after gifts are offered to officials...". With this in mind, it is not surprising that the news from Guangdong has attracted a lot of cynical comment on Sina weibo (a Chinese Twitter-like microblogging site with more than 400 million registered accounts). Not least because this, it appears, was the first time that news of the two month "crackdown" had been reported (the campaign was due to end the following day). Nor was any information provided on the species that were "seized" and what happened to them following their rescue or recovery. The report also failed to provide any detail on the locations of the illegal markets and restaurants. A tweet by Jiling Zaiyuan, a bird-protection blogger, sums up the mood: "This is a strange one. Where were 50,000 [animals] seized in such a short time frame? [Surely] it's not unreasonable to ask for a precise account [to justify the claims]." Another blogger, commenting on the China-wide crackdown tweeted: "I hope that the numerous "special campaigns" by the various authorities are in future less special and actually become an everyday activity". If this happens (as it surely must), then the Beidagang Heroes would deserve much of the credit. They managed to save many storks (13 were rescued and released; but many more would have died had the poisoned "lure pools" not been found and made safe) and, in so doing, they also powered a virtuous cycle of publicity that led to the prompt action by the central government, which in turn fuelled ever more publicity for the campaign to protect China's birds. As well as turning a potential horror story into a wonderful success story, the Beidagang Heroes have also lit a beacon of hope for birds in China. 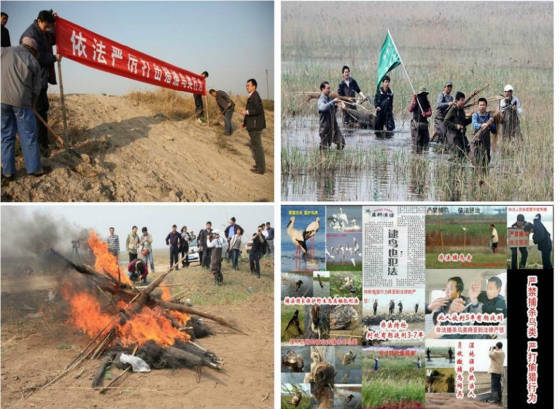 In order to strengthen the protection of Qilihai Wetland's rare birds, and to create an excellent environment for migratory birds, a combined law-enforcement operation has just been comprehensively launched. 16 families, 39 genuses, and 182 species of birds have been recorded at Qilihai; which represents 78% of all bird species ever recorded in our city. In order to protect these birds, Ninge county [in Tianjin] has invested a total of 400 million yuan [GBP 40 million], and has established Xinghai Lake bird reserve at Donghaixingtuo Reservoir. The critical period for the southward migration of birds is precisely now. 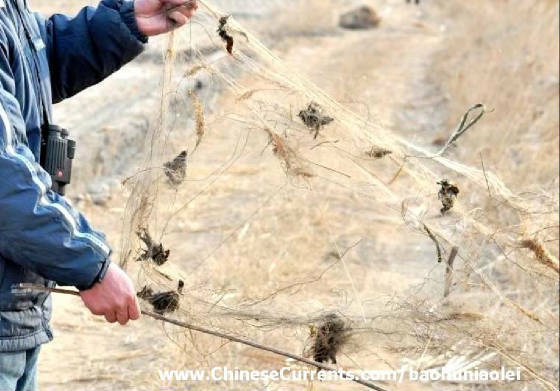 In order to strike against law-breakers' wanton bird-catching activity, Tianjin Gu Coast and Wetland national nature reserve and the relevant departments in Ninghe county have instigated this operation. The most important areas for this law-enforcement action are: the bird's habitat, the food transportation industry, and farmers' markets. A net is also starting to be thrown over ad hoc markets; bird-traders; the process [of buying and selling illegally caught birds]; and the trafficing of all kinds of wild animals. 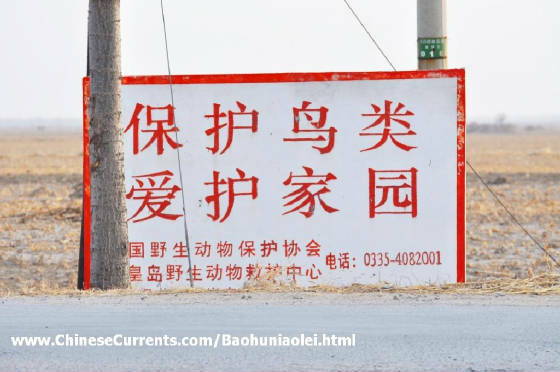 Baokou village in Ninghe county; Qilihai township; Huaidian village; Panzhuang township; and Zaojia town are the main places that have launched [these bird protection law-enforcement activities]. 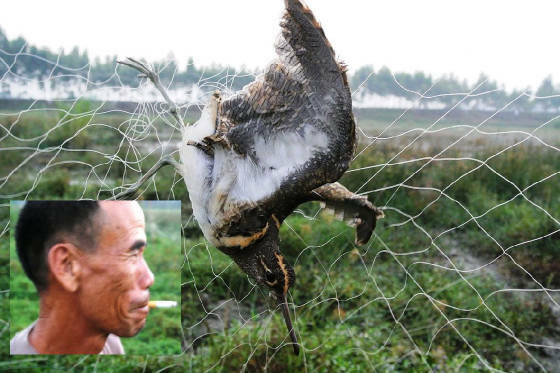 Zhang Houyi destroys the tall bird-catching nets that poachers have erected inside the bird reserve. The 72 year-old is one of the assistant wardens of East Dongting Lake, a national-level nation reserve [in Hunan province]. 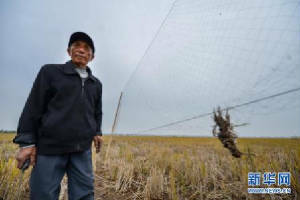 He has protected the migratory birds here for the past 20 years. When he was young, Mr Zhang was the locally-famous “King of Bird Killers”. At the beginning of the 1980s, the country resolved to strengthen the protection of wild birds. At that time, East Dongting Lake became a national-level nature reserve. Because of the law that expressly forbids the hunting of level 1 and 2 protected bird-species, and because he felt ashamed, Mr Zhang switched from being the King of Bird Killers to become the God of Bird Protectors. 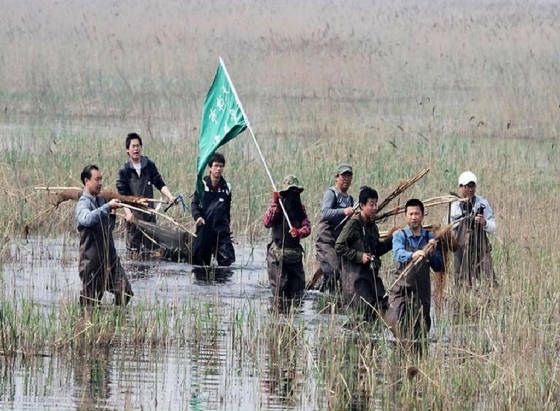 Every morning, Mr Zhang and his colleagues patrol several kilometers of lake-side marsh to protect the birds. Some his former [hunting] associates could not come to terms with his transformation and ridiculed him; some even threatened him. But he’s never regretted making the switch. Mr Zhang believes that protecting birds is not a personal matter, nor is it merely a matter for reserves; but rather that it is something that everyone should be concerned about. Only then will Dongting Lake become a genuine paradise for birds. "During a 3 days visit at Xitou from 26th to 28th of October we have found a total of 32 nets that were, we estimated, 25 metres long, on average . In other words, the total length of nets in this small, bird-rich area was about 800 metres. Most of them were made from old fishing nets and, as such, had been re-designed to catch larger birds. Small birds should have been able to escape because the mesh used was quite large. All of the nets were set up on marshes or wet fields. We were able to observe one farmer in the early morning who, while bringing his buffalos to the wet field, came to check if any birds were in a net. We saw him releasing a Black Drongo that was tangled in one of the nets. Having seen that a Greater Painted Snipe was tangled in one of his nets, I quickly went towards it, to release it before the farmer could capture it. On my way there I asked the farmer if the net belonged to him. He said that it did. So I told him that it was prohibited to do what he was doing; and also tried to scare him by telling him that if he didn't pull the nets down, the forestry department will come back to rmove them. I then got to the Greater Painted Snipe and untangled it from the net. As I was doing this, the farmer was about to pick up a bird that I hadn't noticed previously. It was ensnared in another net. I then demanded that he give me the bird. He refused, so I tried to wrestle the bird from his grip. Finally he let the bird go, and what appeared to be a Baillon's Crake was again free. As we were searching for a place to release the Greater Painted Snipe, we found another field with many more nets than the previous place, but with no people in the field. We released the Painted Snipe there, and I then pulled down as many nets as I could find in the hope that it will not be re-caught. While doing this, I was also able to save a Common Snipe." "I found this guy concealed in a small hide in marshes near Xitou. I was very surprised to see egrets so close to him. And when one of them tried to fly away, I understood [why they couldn't]. Thy were fixed to the ground by wire. Looking at the birds with my bins, I realised that a net was open on the ground near to the egrets. 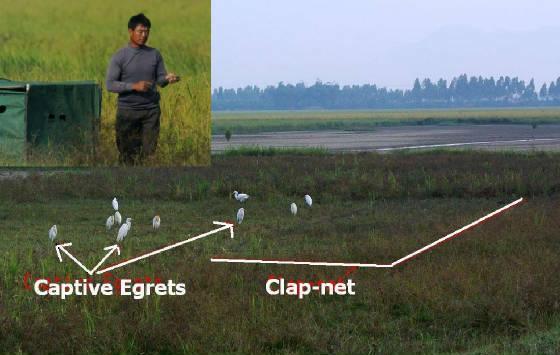 I then understand that he was trying to catch egrets using a clap-net. When the poacher saw me, he stepped outside of his hide. I deliberaly showed him that I was taking photographs of what he was doing. He moved some distance away from the place and waited there until I left, before returning to pick up all his equipment. But he probably wasn't aware of the possibility that he could be digiscoped; and I managed to take some videos and photos of him as he was packing." Local heroes. Please click on the photo to see more photos of them. Many years from now – at a point in time when the number of birds migrating through China is many, many millions more than it is today; when membership of the CSPB (the China Society for the Protection of Birds) tops 10 million; and when every school in China has a birdwatching society – legions of older Chinese birdwatchers will tell and re-tell the horror stories of the dark time when it wasn't like that. They will tell the young ones of the time when, many years before, millions of migrant birds were slaughtered for their meat or imprisoned in cages because of their beautiful plumage or melodious voice. They will tell of the countless numbers of birds that were left to die in the trappers' nets because they were neither beautiful nor edible. And they will talk of the time when not nearly enough people cared. They will also recount the true story of how this began to change... and how that became the story that inspired a generation of young people. Many years from now, the school book "Protecting the environment in China and how you can help" will tell of the events of the 15th October 2012 and of the local heroes who, because of what happened on that date, were launched into the limelight to become beacons of hope in what was a dark period for China's birds. Guidong County was an out-of-the-way mountainous area in Hunan province. It was a remote, backward place. It was also a lawless place. The [Chinese] adage that "The mountains are high and the emperor is far away" was as true in Guidong in 2012 as it was when the maxim was coined, a thousand years before. Hundreds of people in Guidong had guns (despite this being a serious crime). Hunting parties of up to 200 would go out at night using high-power search lights to lure huge numbers of migrating birds, which they mercilessly shot. This had been going on for years. Everyone in Guidong, including the local police and authorities, knew this was happening. But nothing had been done about it. Until, that is, a very brave reporter from the Changsha Evening News, the provincial capital's most popular newspaper, went to Guidong to expose the criminality there. In several visits, Li Feng infiltrated the hunters' ring and compiled the evidence that would be the catalyst that changed attitudes. He secretly filmed the hunters at their "safe houses", the night-time shooting parties, and also filmed the traders selling the carcasses of the shot birds in local markets. In Guidong, the market price of a bird was determined by the length of the bird's neck and by the taste of its meat. Xinhua [China's official news agency] reported that: "Birds with long necks, such as egrets and herons, sold for between 10 [US$1.60] and 70 yuan, while short-necked eagles and owls are priced at hundreds of yuan as the taste of their meat is preferred." Xinhua also reported that in the counties of Guidong, Xinhua and Xinshao, hunting parties from one village alone could kill,”150 tonnes of wild birds a year". The local hunting parties also included rich people from outside the area who would pay a lot of money to shoot herons, egrets, owls, and eagles and "...Come in luxury limousines with beauties and beers, taking it as an aristocratic pastime, which has become a troublesome fashion" [Xinhua reported, citing Mr Yang, a local forestry worker]. In the autumn migration of 2012, Li Feng, a local-hero journalist risked his life to shoot the video that exposed the gunmen's evil deeds. The video also pointed the finger at the corrupt local police and officials who allowed this to happen under their noses. The video first ran locally in Hunan. The people who saw it were outraged. So much so that they told others about it. In turn, these people passed on the link to their friends and contacts. The ever vigilant TV networks, realising that this was becoming a big story, began screening the video locally (in dozens of different places). By the end of the 14th October, many thousands of people had seen the video. Then, on October 15th, there was a tipping point. During that day, interest in the story reached critical mass... and the social media version of a reactor meltdown was unleashed. Interest in the story exploded with such incredible ferocity that, by the end of that day, millions of people had seen the video or read about the atrocities that had been perpetrated in Hunan province. The public was horrified and very, very angry. One blogger, a Ms Liang, wrote on Sina Weibo, "How could this happen??!! We should be ashamed!! The corrupt officials who let them [the gunmen] get away with it must be severely punished!!" In the days following this news peak, more and more influential news agencies published their condemnation of not just the slaughter, but also the local authorities' complicity. "The truth is that local forestry officials and police are shirking responsibility, because they can stop the brutal killing of birds if they strengthen joint law enforcement. For a change, they can stop the selling and buying of migratory birds in local markets, and impose heavy fines on people indulging in such activities". 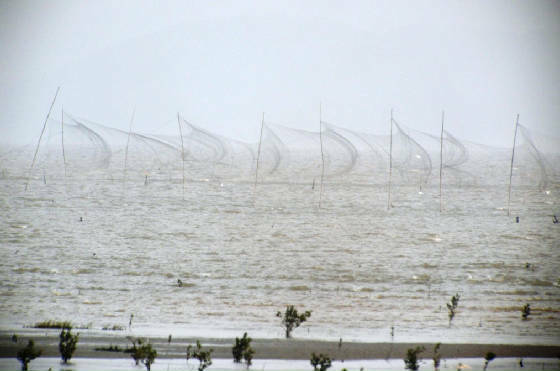 Qilihai reserve, two nets,each 30 meters long, 1.5 meters wide. about 20 dead birds on the nets, one Little Bunting still alive. I released it. It could fly. So I let it go. Beidagang reserve, lots of mist nets, 1.5 meters in wide. The net had been left for many weeks. "In Guangdong, usually nets are set-up during the autumn migration. I guess people check them regularly during the peak time, but afterwards the nets are left there for months. It is very common to see more than 10 to 20 nets, some of which are a few hundreds metres long. Some ponds or marshes are simply surrounded on each side by nets, giving the birds no chance to escape them." 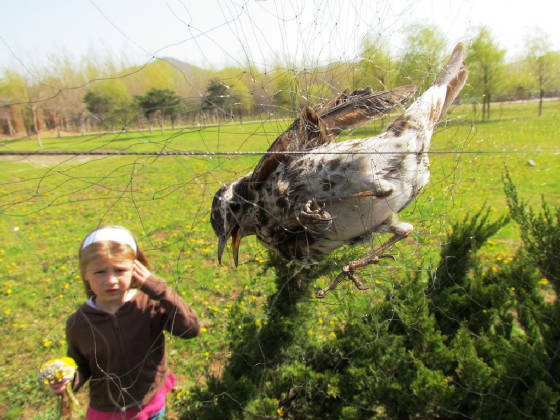 "Nets were ripped apart and left on the ground for the owner to find - my daughter (in the one photo) did most of the ripping! The siskin died after I tried tried to release the net from being tight around its neck. There really wasn't any hope of being successful. The net had mostly siskins and Dusky Thrush in it. There were Brambling feathers around it though and a few thrush heads." "I was on Chongming Island, at the mouth of the Yangtze River in Shanghai, November 2011. I was with Li Jing, a Shanghai birder, and my partner Dev, an Indian birder living in Shanghai. We found mist nets near Dongtan Reserve. 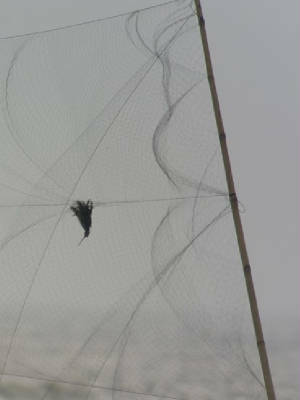 We found no birds in the nets, suggesting that whoever set the nets up checks them regularly. We tore the nets down and called the Forestry Bureau. The Forestry Bureau arrived very quickly. The rangers immediately burned the nets. As the nets burned, Li Jing and I posed in front of the fire. Dev took our picture." This sick joke of a sign next to the killing fields says "Protect Birds, Cherish the Environment"
I waited in the wood for this man (pictured below) to finish setting up his net before emerging to tear it down in front of him. As I was doing this, he gathered his two cages and ran. 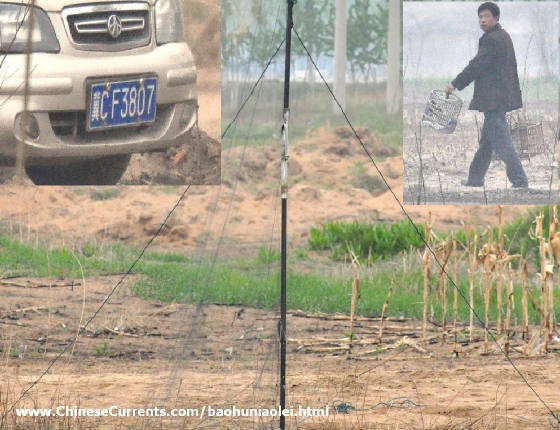 Each cage contained a Chinese Grosbeak, whose song was being used to attract birds into the area he had placed the net. The attached (including the photo of his registration plate) was sent to the local authorities.